Website and processes: 17 Jan 16 sarah, 4/5 Good "all ok thanks"
Welcome refreshments followed by a pre-flight briefing with your Experienced Flying Instructor. This will cover * Time in the aircraft - airborne/taxiiing. * Effects of control and how an aircraft flies. * How the headset works and speaking to air traffic control. * Safety Brief including airfield and air-side safety, safety equipment in the aircraft and how to use it and procedures in the event of an unexpected landing. You will be involved in all stages of the flight from checking over the aeroplane to start-up and taxiing the aircraft for departure. You will then taxi and take off for a flight of the local area with breathtaking views down the Severn Estuary with its two Suspension Bridges, The Forest of dean and The Malvern hills. Under the expert supervision of your Flight Instructor, you will be invited to take the controls and feel what it's like to actually fly the plane for yourself. All communication in the aircraft is maintained through an aviation headset which we will provide. After your general handling lesson you will experience and be shown how the aircraft is routed back into the circuit pattern of the airport by Air Traffic Control. Finally you will have a Pilot's eye view of what landing a plane is actually like viewed from the best seats in the house....the cockpit! You will then taxi back to HQ where you will again be invited to have a go at steering along the taxiway. After the flight you will be presented with a Flight Experience Certificate which is signed by your Instructor. Once parked, you will have the opportunity to take photographs with the aircraft and look around other types of aircraft in the hangar. During this time your instructor will be happy to discuss any aspect of the flight, learning to fly for fun or even discuss the career opportunities available for tomorrows Airline Pilots. There is no Min or max age but under 18's need a parent/ guardian in attendance. Fitness: Must be medically fit - No colds/ flu or ear infections. Must not have sub-aqua dived in last 24 hours. Don't forget To bring: Camera, Casual /Comfortable clothing, Parent/Guardian if under 18yrs. Please feel free to bring friends and family along for the special event. 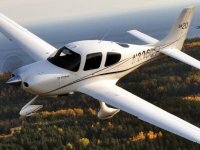 All of our Trial lessons are carried out in Four seater aircraft at the moment and they are either the Piper Warrior PA28 or the Cirrus SR20. At pilot's discretion a friend or relative may accompany you. Pre flight Briefing 25-30 minutes. Taxiiing and flight minimum 30 minutes. Post flight briefing. 10-15 minutes.